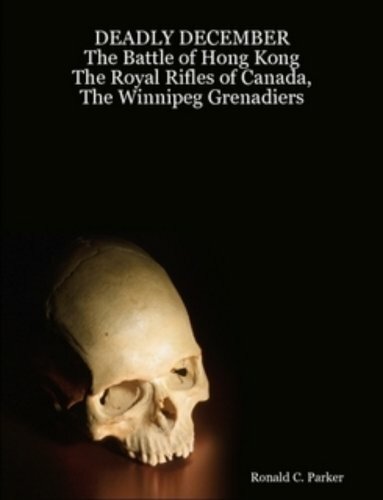 Ronald C Parker, the son of a WW ll Hong Kong veteran, has written a book that tells the wrenching story of one of the great battles of World War ll , “DEADLY DECEMBER, The Battle of Hong Kong ”. He is the son of Major Maurice A Parker, Commanding Officer of “D” Company, The Royal Rifles of Canada. The author was born on April 28, 1939 in Quebec City. He spent 7 1/2 years in the 57th Loc. Bty., RCA (Militia). He moved to London, Ontario in 1962 where he resides with his family to this day. On December 8th 1941, hours after the Japanese attacked Pearl Harbor, they launched an air attack on the British Crown Colony of Hong Kong. For the first time the saga is told from a Canadian perspective, using the words of those soldiers who fought that, long ago, almost forgotten battle. Some 50,000 battle-tested Japanese soldiers stood poised on the mainland waiting to storm Fortress Hong Kong. It was defended by 15,000 inexperienced British, Indian, and local militia troops, along with Canadian soldiers from The Royal Rifles of Canada and The Winnipeg Grenadiers. This is their story. This book DEADLY DECEMBER is dedicated to his Dad, and to all the brave men and women who fought The Battle of Hong Kong. It is meant to keep the memory of those men and women alive. his book is published by Lulu, founded in 2002, Lulu (www.lulu.com), is the world’s fastest-growing provider of print-on-demand books. Lulu provides a market place for struggling authors. They need not struggle more. Follow this link to http://www.lulu.com/content/561522 to purchase the book.